Busy during daytime? No problem. Seabass feeds very well after dark. Early spring and fall is the prime time for seabass fishing after dark, but you can still catch them during summer or winter. 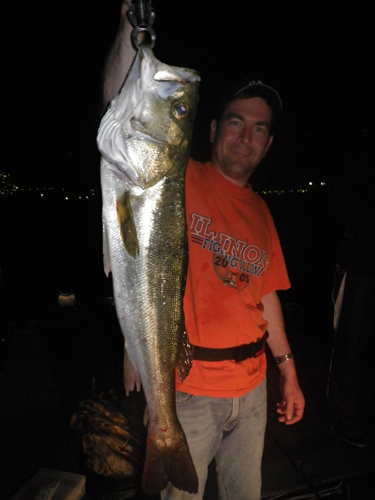 Mr. Daren Yergler from Illinois with nice size seabass taken after dark in month of July. When the conditions are right, you can expect exciting topwater bites. You can even catch them on fly gear as well. 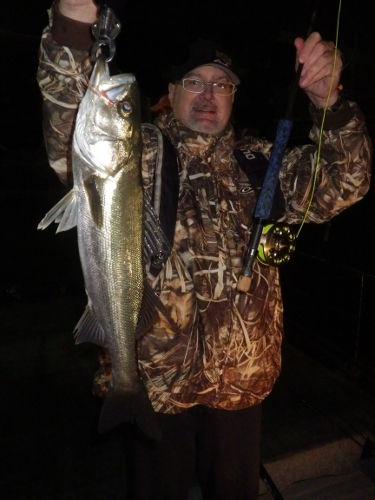 Well known custom rod builder, Greg Vella with fine spring seabass after dark on his custom fly rod.